TAG Heuer presents a sporting timepiece that exudes everyday sophistication and their signature sporting design. 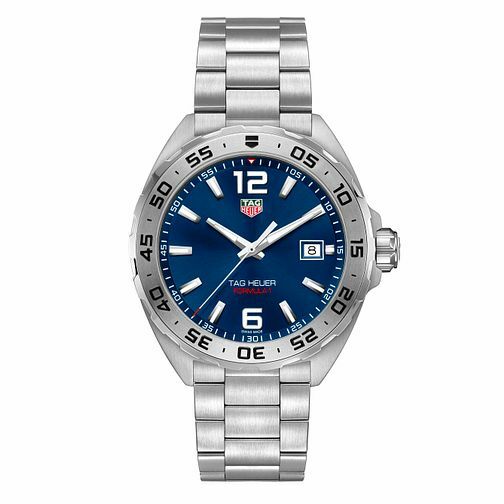 The dial features a cool blue with clear luminescent indices for enhanced readability and the iconic TAG Heuer emblem at the 12 o'clock mark. A rotating bezel helps you track a minute with ease with five second increments to further add accuracy. The stainless steel bracelet features a brushed metal finish to add further flair with water resistance of up to 200m. The watch has been made with the expertise and fine crafting of years of Swiss watchmaking. TAG Heuer Formula 1 Men's Stainless Steel Bracelet Watch is rated 5.0 out of 5 by 1.